A commenter here a while back argued that RCP 8.5, the highest emission scenario in the current IPCC report, is impossible, because it requires more coal than is available to be mined. I recently came across a more detailed version of that argument in a published piece by David Rutledge, a Caltech professor. for coal the pattern has been that countries produce only a small fraction of their early reserves, and then late in the production cycle the reserves drop to match the coal at the last working mines. This pattern is seen in the UK (cumulative production of 19% of early reserves), Pennsylvania anthracite (42%), the Ruhr Valley (14%), France and Belgium (23%), and Japan and South Korea (21%). This means that the reserves criteria have been too optimistic, but it also means that world coal reserves are a good upper bound on future production. By the author's calculation, RCP 8.5 requires the world to consume 200% of total coal reserves by 2100, 700% by 2500. If he is correct, it follows that RCP 8.5 ought not to be included in the IPCC graphs showing possible future climate change and that maximum values of temperature change or sea level rise ought not to include the values it would imply. 1. Can anyone point at a serious mistake in the argument? Does it misstate the amount of coal consumption implied by RCP 8.5, the size of coal reserves as currently estimated or the reasons to think that current estimates represent a reasonable upper bound? 2. Is there anyone here otherwise inclined to support the IPCC who, having looked at this argument, agrees that the inclusion of RCP 8.5 in the report is fraudulent, an attempt to make risks of future warming look worse than they actually are? In my previous post I took issue with Lovejoy's claim to show, by statistical analysis of global temperature data since 1500, that the probability that natural processes would produce the amount of warming observed in the period 1880 to 2008 was less, probably much less, than one in a hundred. My complaint was not with his conclusion, which might well be true, but with his argument. In order to calculate the probability that what happened would happen as a result of natural causes of temperature change, Lovejoy needed a probability distribution showing what the probability was of a natural cause producing any given temperature change. 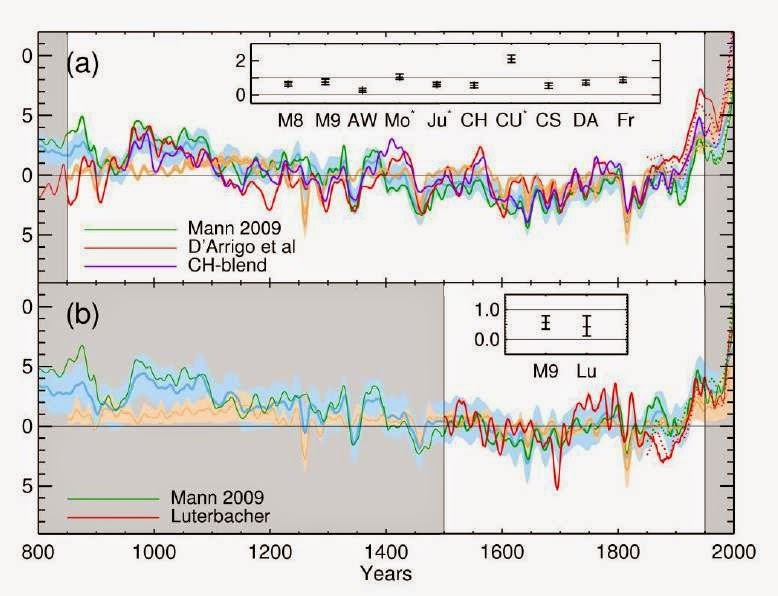 He could estimate that distribution by looking at changes over the period from 1500 to 1880 on the (plausible) assumption that humans had little effect on global temperature over that period. But that data could not tell him the probability distribution for events rare enough to be unlikely to show up in his data, for instance some cause of warming that occurred with an annual probability of only .001. His solution to that problem was to assume a probability distribution, more precisely a range of possible distributions, fit it with the data he had and deduce from it the probability of the rare large events that might have provided a natural cause for 20th century warming. That makes sense if those events are a result of the same processes as the more frequent events, just less likely versions of them—just as flipping a coin and getting eight heads in a row is a result of the same processes that give you four, five, or six heads in a row. But it makes no sense if there are rare large events that are produced by some entirely different process, one whose probability the observed events tell us nothing about—if, for instance, you got four heads in a row by sheer luck, forty heads in a row because someone had slipped you a two headed coin. The forty heads, or the hypothetical rare cause of large warming, would be a black swan, an event sufficiently rare that it had not been observed and so was left out of the calculation. It occurred to me, after considering a response by Lovejoy and a comment on the Google+ version of my post, that not only was such a black swan event possible in the context of climate, one had occurred. AGW itself is a black swan, a cause of rapid warming whose probability cannot be deduced by looking at the distribution of climate change from the period 1500 to 1880. If the point is not clear, imagine that Lovejoy wrote his article in 1880. Since warming due to human activity had not yet occurred, there would be no reason for him to distinguish between causes of warming and natural causes of warming. He would interpret the results of his calculations as showing that the probability of warming by a degree C over the next 128 years was less, probably much less, than .01. He would be assuming away the possibility of some cause of substantial warming independent of the causes of past warming, one whose probability could not be predicted from their probability distribution. That cause being, of course, greenhouse gases produced by human action. An assessment of the observational evidence indicates that the AR4 conclusions regarding global increasing trends in hydrological droughts since the 1970s are no longer supported. ... we conclude there is low confidence in attributing changes in drought over global land since the mid-20th century to human influence. Contrast that to all the claims blaming the current California drought on global warming. Globally, there is low confidence in any long term increases in tropical cyclone activity (Section 2.6.3) and low confidence in attributing global changes to any particular cause. Or, in other words, Chris Landsea was right. Contrast the final sentence to occasional claims that recent unusual cold is evidence for, not against, "climate change." 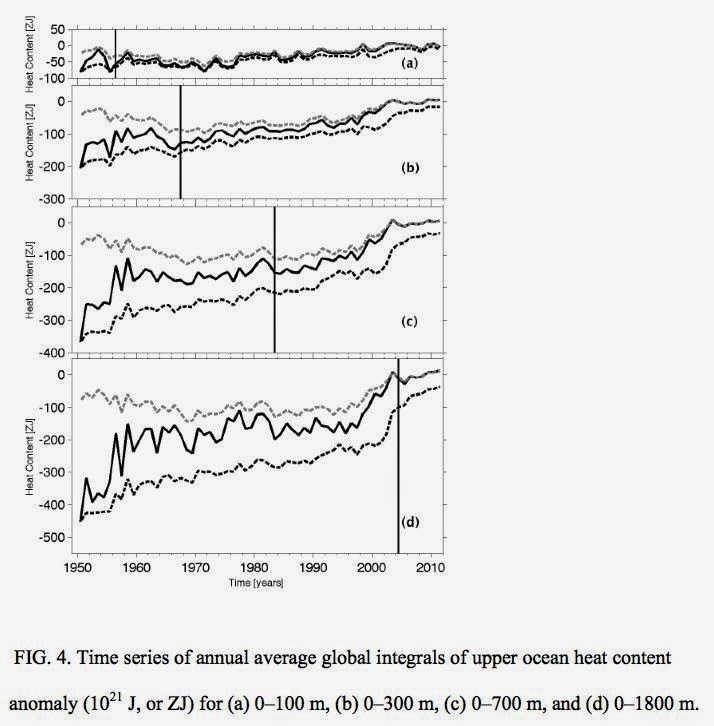 The chapter also contains a graph showing estimates of northern hemisphere temperature over the past 1200 years. It appears from the green lines, due to Michael Mann of hockey stick fame, that the medieval warm period is back, with a peak close to current temperature. Readers will be familiar with my critique of Cook et al. 2013, an article widely cited as showing that 97% of climate researchers support "the consensus position." I have just come across a much more detailed criticism of the paper on other grounds, by someone much more extensively involved in climate issues than I am.